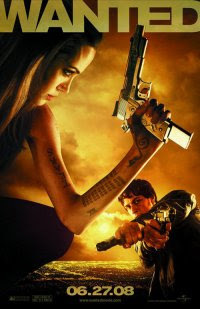 Hmmm, a summer action movie with Angelina Jolie, and my wants to see it. A no-brainer, right? I guess I should be forthcoming and admit that I could be adequately entertained watching Angelina Jolie flip pancakes. In “Wanted,” she doesn’t flip any pancakes, but instead she plays a secret-society assassin who targets victims handed out by a loom of fate. Hey, that’ll do! But, I wasn’t greatly entertained. The movie begins with a character, Wesley, in circumstances that asks the question, “What are you doing with your life?” Wesley, who is difficult to consider as a protagonist, unfortunately is far more believable as a 9 to 5 loser than the finely honed killing machine that he becomes. Jolie is one of a society who trains Wesley to emerge as someone taking control of his life. I suppose I haven’t lived life fully until I become an assassin as well. Alas. As for Jolie, I’ve seen her in “Tomb Raider” and “Mr. and Mrs. Smith.” She knows action movies and how to wield a gun while looking both good and capable, but we never really get to know her here. She’s basically window dressing, while we follow the plight of Wesley, who must avenge his father’s death by killing a rogue assassin. Aside from the unconvincing “Fight Club” development of Wesley, the movie suffers in other areas. Special effects are certainly expected in action movies, and often, they sparkle here. But, it’s an overindulgence to suggest that by swinging your arm while firing a gun that your mind (and/or physics) will cause a bullet to not only bend in its path, but complete a loop. “Myth Busters” tried this with magnets; sorry folks. Other "over the top" feats are included, but that is almost expected these days. At least “The Matrix” provided a reason for physics to be ignored, but we’re asked to believe that a assassin group borne out of an ancient group of Weavers (yes, textile workers) somehow knows better. Which brings us back to the loom of fate. As explained, the loom weaves a fabric, and errors in the weave are translated by binary code into letters which spell out the names of would-be targets. This is compelling from an understood sense of “what if’s” that trail behind us. What if…I had proceeded through the traffic light without looking first? What if…I had accepted that other job offer? What if…I turned left instead of right at the fork in road? And so on. This is the hand of fate, something we all reflect upon at some time in terms of chance or providence. Of course, the loom is also completely absurd. But movies need their plot devices, so let’s yield to the notion. There is a mystery to it. How does the loom do what it does? Who made the loom? How does the loom translate fate into a discernible code? How was the code revealed? Where was it made known what the response should be to the deciphered code? Even better, how did the loom come to foreknowledge of the moral attributes of those named? Interesting questions, all of which are completely unanswered in the film. Without completely spelling out the p.l.o.t., the names provided from the loom are revealed to no longer be true to their source, but perverted by human self-interest. This, in itself, is predictable for Hollywood purposes that require lots of action and a timely conclusion. But, consider that it also runs counter to popular thinking. An example: DNA is coded information that is rapidly being understood to literally spell out our physical attributes. We’re taught to accept that this code resulted from time + chance (fate? ), resulting in my brown hair and blue eyes, amongst other features. The moral component we understand to have evolved on our own after generations of societal constraints and a need for self-preservation. In short, we don’t need an author of the Code, and those that do seek an author are frequently ridiculed. The fictional loom, however, is accepted to have provided coded information from an unknown and unstated source that had a moral underpinning, at least until it was defiled by human tampering. It’s curious that the movie writers took the “easy” way out, assigning a human author to the Code, rather than fathoming the mystery of fate itself, a credit that resulted in “The Matrix” becoming something more than just another action movie. To be sure, Hollywood wants their summer blockbusters, and this is enjoyable fun. That said, some conjecture regarding the origins of the loom might have made this something more than a pancake flipping mindless flick. Oh, and did I mention Angelina Jolie looks good? I hope you don't mind me contacting you like this; I figured you'd be interested (since you watch Mythbusters and everybody likes Shark Week!). Feel free to contact me if you'd like to hear more info; I work with Discovery and definitely have the inside scoop. Have a great day, and keep up the nice posts on your blog.